Ernst A. Guillemin (IRE Associate, 1941; Senior Member, 1948; Fellow, 1949) was born in Milwaukee, WI, on 8 May 1898. He received the B.S. degree from the University of Wisconsin, Madison, in 1922, and the S. M. degree in 1924 from the Massachusetts Institute of Technology, Cambridge, both in electrical engineering. In 1926, he received the Ph.D. degree from the University of Munich, Germany, on the Saltonstall Traveling Fellowship. 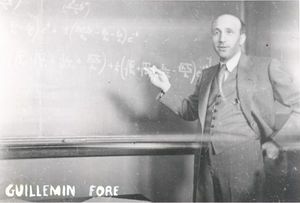 Dr. Ernst A. Guillemin teaching at MIT in 1939. He returned to M.I.T. as an instructor, becoming Assistant Professor in 1928, Associate Professor in 1936, and Professor of Electrical Communications in 1944. He helped build his department’s Communications program and taught linear, passive, lumped, finite, bilateral networks. In 1941, he took on the administrative responsibilities of the Communications Option, Department of Electrical Engineering. He was appointed to the Edwin Sibley Webster Chair of Electrical Engineering in 1960 and held the position until his retirement in 1963. Guillemin was an excellent teacher. He had a gift for presenting even complex material to students and thus was able to bring into undergraduate classrooms subjects often saved for graduate study. He inspired many students who did well in their own right, including Sidney Darlington, William Hewlett and Robert Fano. His lectures were famously interesting and his textbooks well written. He was the author of the volumes, Communications Networks, Introductory Circuit Theory, Synthesis of Passive Networks, and a reference work entitled, The Mathematics of Circuit Analysis. Like many other engineers of his generation, Guillemin also helped with war efforts during World War II. In 1940, Guillemin was appointed consultant to the Microwave Committee of the NDRC. In this capacity he devoted approximately half of his time to consultation with various groups in the Radiation Laboratory, M.I.T., on problems dealing with the design of electrical networks for special applications. Guillemin was awarded the President's Certificate of Merit for his outstanding wartime contributions in 1948. Guillemin was a member of the American Society of Electrical Engineers and a Fellow of the American Institute of Electrical Engineers and the American Academy of Arts and Sciences. He was awarded the IRE Medal of Honor in 1961 "For outstanding scientific and engineering achievements." He died in 1970, just a few weeks short of his seventy-second birthday. This page was last edited on 22 January 2019, at 16:38.